Open Box Remo Renaissance Ambassador Bass Batter 32 in. A warmth, sensitivity, and articulation reminiscent of calfskin all characterize Remo Renaissance heads. 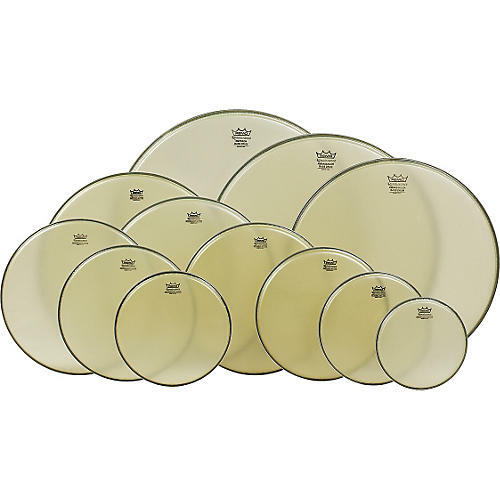 These drumheads have a very warm, tonal sound that's great for melodic expression and affords a wider, more balanced sound spectrum for tympani, snares, toms, and bass drums in any drumming application. For bass drums, Remo Renaissance Ambassador drumheads creates a deep, round sound with a low fundamental and moderate attack. This combination allows a low pitch and high degree of control over decay as tuning and a variety of muffling techniques to modify the pitch and attack in acoustic and mic'd situations.